Susan Carew has an Economics and Marketing degree from Griffith University, 1991. Susan is a Graduate in Peace Studies from La Trobe University, Melbourne, 2002. Susan has completed a Certificate IV in Training and Assessment at KAL Multi-Media, 2007. Alternatives to Violence Trainer, 2008. 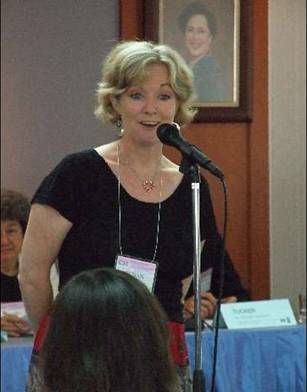 Susan completed the Rotary Peace and Conflict Studies Program (Rotary Scholarship) Bangkok, Thailand, 2008. Susan Carew the Principal of WorldPeacefull. Susan is a qualified corporate trainer and has developed training programs that can be adapted to your organisation. Her unique service offering is to combine carefully targeted research to determine conflict issues and wellbeing needs with effective training that empowers staff and management to deal with conflict in a range of workshops and effectively reduce stress to build community through laughter, fun, clowning, juggling and learning happiness. Wellbeing has a powerful effect on work performance and staff retention. Susan knows that positive and proactive participation at work is essential for productivity and personal potential in reaching goals. In today’s workplaces there is considerable stress, competition, communication issues, bullying and harassment behaviours that affect personal happiness and performance. The key is effective training that catalyses positive attitudes to problems and facilitates positive ways of handling conflict and enhancing wellbeing, so everyone can win. Susan teaches that wellbeing and conflict are two halves of the whole, each training focus leads to growth and positive outcomes. Susan’s workshops lay the groundwork for helping people to see differently and to look for the opportunity in situations and take ownership of their negative thoughts in order to transform conflict into innovative creativity, working cooperatively and wellbeing. Susan has observed over the years that when people connect with inner happiness they find creativity and purpose in what they do and they handle conflict better adopting peaceful attitudes with confidence. Susan has observed people move from learned powerlessness to proactive purposeful empowerment where they take responsibility and are given autonomy. This has significant impacts on resilience in life, enthusiasm, expanded work potential and improved corporate outcomes. Susan has an in-depth experience of corporate settings having worked in approximately 400 companies across most industries. This experience provided a depth of insight into issues that are prevalent within companies and organisations. Susan was invited to mentor middle level managers for the Enterprise Development Institute of Australia (later the Institute of Company Directors) in Canberra for approximately 8 years. Susan has 10 years experience as a senior market analyst researching customer opinion and satisfaction studies for a wide variety of clients. Susan has taught marketing and market research at tertiary level. Susan was invited by the famous American Clown Doctor, Dr. Patch Adams to clown with an international team of clowns in Russia. The clowns visited orphanages, hospitals, nursing homes, shopping centre’s and were a visible presence on the streets of Moscow and Saint Petersberg. The purpose of clowning in this context was described by Patch as enabling people to experience a tribe environment and give loving service. The experience reinforced positive change through action. To create something you have to ‘be’ it or lead by example, as Gandhi stated: ‘To Be the Change You Wish to See in the World ’. Susan is a Rotary Peace Scholar and was chosen from a world wide candidacy to study Peace and Conflict Studies at Chulalongkorn University, Thailand. This course of study combined both theoretical study provided by experts from across the globe and also practical field trips to develop conflict mapping, conflict resolution skills and sensitivities to conflict issues. Rotary selected professionals from Kashmir, DRC Congo, USA, Canada, Nigeria, Brazil, Timor Leste, India, and the Philippines. The course was comprehensive, setting world standards and life changing. Whilst in Thailand Susan conducted Healing and Humour workshops for Chulalongkorn Hospital (Thailand). These workshops were the first in Thailand. She later travelled to Vietnam and provided workshops for mental health professionals (Community Research, Training Center for Community Development, Hanoi). The work was to integrate emotional intelligence and team building through clowning and laughter. Susan was invited to speak at the International Conference on Peace and Reconciliation at the University of Melbourne. She has had significant experience as a public speaker with Rotary, community groups, business seminars and networks and has been interviewed in the media about her unique experiences and educational programs. Susan produced a values based peace, nonviolence and anti-bullying program for children entitled REAL HOPE for primary school children in Australia. This program is unique teaching and empowering non violent and peaceful behaviours. Susan has travelled the world speaking about harmony, wellbeing, humour and nonviolence. On her world trip she travelled to 20 countries performing in schools, hospitals and on the streets. She conducted workshops and lectures on peace education in Costa Rica, Bolivia, India and Bangkok. Susan recently returned from Nepal on a Rotary education project where she taught teachers and children conflict resolution, peace and values education and positive teaching styles for the classroom. Her motto is to Live, Laugh and Be Happy.